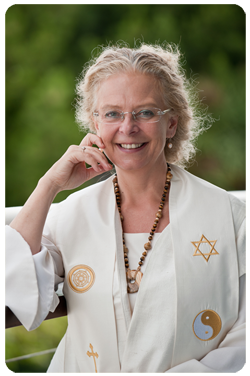 Interfaith Minister, Annie Blampied is a highly experienced and gifted celebrant. Whatever your needs, a wedding ceremony, a blessing and naming for a baby or child, a funeral, a house blessing, or any other rite of passage, she will be there for you, with her heart-felt style, clear and deep insights, humour and grace! She also offers one to one spiritual counselling, or mentoring for anyone who longs for inner peace and happiness; or who is so tired of their story that they truly want to let it go. Her spiritual companionship will give you insights, inner strength and courage to bring to the light whatever seems to be the problem, and open to another way. She is also able to offer supervision to other therapists and counsellors, and spiritual direction to anyone wanting support and guidance on their spiritual path. In 2015, Annie trained with Soul Midwife, Felicity Warner, to accompany people in the process of dying. See Soul Midwifery page. As an apprentice soul midwife, Annie offers her services for free to anyone wanting support in creating a death plan or spiritual companionship in the days leading to the time of crossing the threshold. From time to time, Annie writes a blog exploring the themes of forgiveness, especially through her inspiration from A Course in Miracles. She also offers workshops, talks, and guided meditations on the theme of forgiveness, freedom to love and inner peace. A weekend to help you tune-into your Sacred Self with a great line-up of international speakers including Annie Blampied.